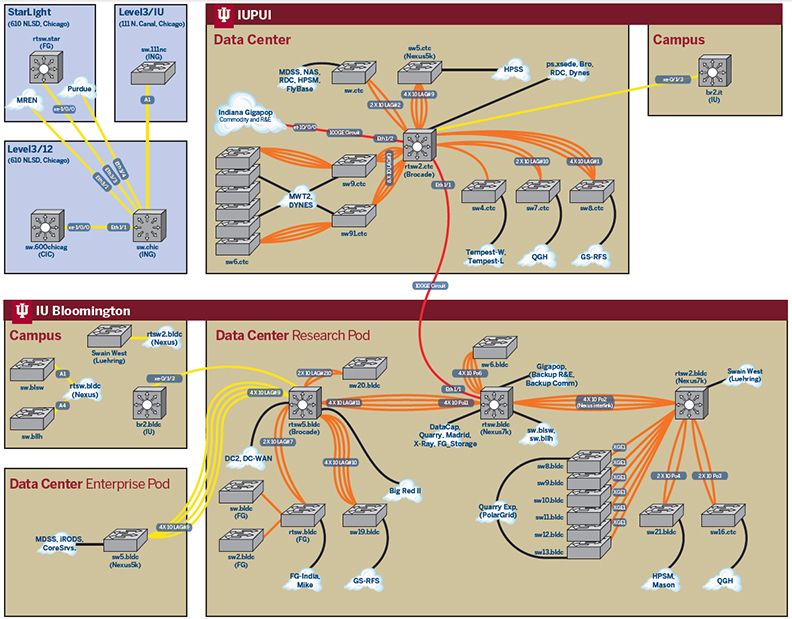 The IU Science DMZ (previously known as the Indiana University Research Network) is a dedicated computer network optimized to accommodate the vast amounts of research data produced by applications critical to scientific discovery and innovation. In operation since 2004, the IU Science DMZ is based on the "Science DMZ" network model introduced by the Energy Sciences Network (ESNet). Unlike networks optimized for general-purpose "enterprise" IT services, the IU Science DMZ integrates high-performance hardware, custom security policies, and real-time monitoring and testing systems engineered specifically to support the data movement requirements of data-intensive science applications. The Science DMZ's high-performance network hardware is used exclusively for transferring research data between IU systems, and between IU and external networks. Its security policies are tailored to ensure maximum performance and baseline security. Its administrators closely monitor traffic, performance, and security, and can respond to security threats by applying more finely tuned firewalling to the network and on individual hosts on a case-by-case basis. The IU Science DMZ is operated by the Research Technologies division of UITS and the IU Global Research Network Operations Center (GlobalNOC). The GlobalNOC monitors and records network traffic and performance, and makes both live and historical data available via the IU Research RealTime Atlas web interface. This is document bfam in the Knowledge Base. Last modified on 2018-07-16 15:51:14.